Spinach and feta hummus is a garlicy, tangy hummus using chickpeas, spinach, feta and lemons. An easy appetizer that comes together in no time at all. We’re experiencing another fierce heat wave in Los Angeles – the kind of weather were you just want to sit in the shade, drink lots of ice tea and have something easy to snack on for lunch – like spinach feta hummus. Hummus is so easy and versatile. You can flavor it with whatever appeals to you. I went with a savory, tangy puree of fresh spinach, salty feta and chickpeas. The addition of garlic and lemon brings a garlicy, bright flavor to the hummus. 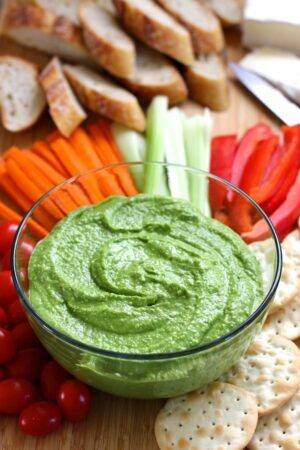 I love the bright green color of this hummus as well. This spinach feta hummus is a silky, smooth hummus because I peeled the chickpeas. In the past I’ve been peeling the chickpea by hand, one chickpea at a time. Rather than peeling the chickpeas individually, put the chickpeas onto a clean dish towel – lined with a piece of paper towel. Next, place another piece of paper towel on top of the chickpeas and then place another dish towel on top of the piece of paper towel. Now, gently roll the chickpeas back and forth between the two pieces of paper towel – with a little downward pressure. This will separate the chickpea skins – you just have to pick them out. Or rather than picking them out individually by hand – after rolling them between the paper towel, just add the chickpeas into a bowl of water and the skins will float in the water. Not on top of the water though – they kind of float suspended mid way in the water and then you can just scoop them out with your hands. After scooping them out – drain the chickpeas and you’re done. I peeled the chickpeas, please see above for the method I used. Peeling the chickpeas is not absolutely necessary – but it will give you a smoother, silkier hummus. But if you’re pressed for time – or don’t feel like doing it – then use the chickpeas whole. The hummus will be great either way. This spinach feta hummus needs a little time for the flavors to develop. So make it in the morning and then put it in the fridge for at least 30 minutes but preferably an hour or two before serving. Overnight would be even better. A garlicy, tangy hummus using chickpeas, spinach, feta and lemons. 4 oz feta – cut into cubes. 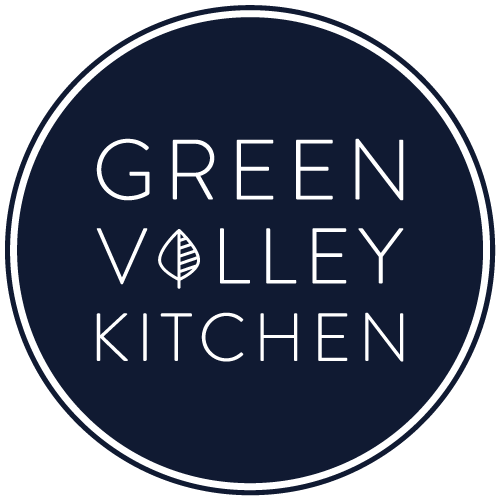 Prep all your ingredients – wash the spinach, peel the chickpeas (if you’re planning on doing this – if not then use them whole), juice your lemon, roughly chop the garlic, etc..
Add all ingredients except feta to a food processor and process until smooth. About 2 to 3 minutes. Add feta and blend to combine – about 1 to 2 minutes. Serve with your choice of crackers, bread or fresh veggies. Do you drain the chickpeas, or leave them in their juice? I’ve seen recipes where both are done, so just wanted to make sure. Can’t wait to try this when I get home. Thanks! Hi Sarah – I drained and rinsed the chickpeas. I’ve updated the recipe to make it clearer – thanks! Hope you enjoy it. I love any sort of bean dip and this one is definitely on my list of ones to try, Geraldine. 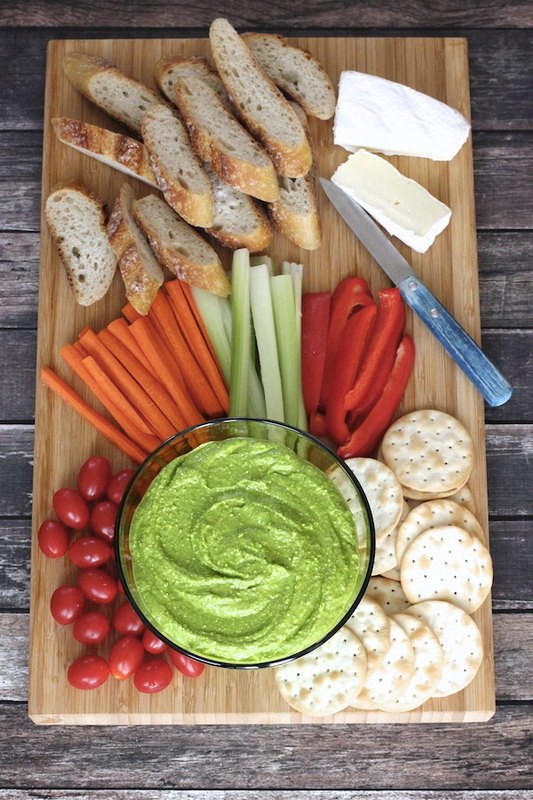 I love the color and how smooth the hummus looks, plus the spinach makes it so healthy! I’m definitely going to need to try the chickpea tip, too. Thanks for sharing! Thanks, Julia! I love the color too – such a pretty bright green. I really need to try this! I love hummus! Im not sure you got my email about the Writing Process Blog Tour since I got no answer! 🙁 I would like to nominate you because I love reading your blog! 🙂 Let me know what you think!!! Hi Olivia – I never got your email 🙁 – I’ll email you directly tonight to touch base. Thanks so much! Oh wow, this hummus looks amazing, Geraldine! I read somewhere that you can soak dried chickpeas in water & baking soda overnight and it helps break down the skins…never tried it though. Hi Denise – next time I make chickpeas from scratch I’m trying your suggestion – I’m always looking for easier ways to do things. Thanks! This is such a vibrant recipe, Geraldine! I never thought of putting spinach in hummus but I appreciate how it bumps up the nutrition in this delicious spread! And it is beautiful! Thanks for the tips, too, on pealing the chickpeas. I would have never done it one, by one. But between your and Crystal’s tips, I totally feel like its doable! BTW – your photographs are crystal sharp! Way to go!!! This dish absolutely jumps off the page! Thanks so much, Traci. Spinach is great addition to hummus – it makes it such a pretty bright green color. Your tip about using a tripod really help with the photos – I just had to figure out how to properly use it :). Thanks for the tip, Crystal! It worked really well.